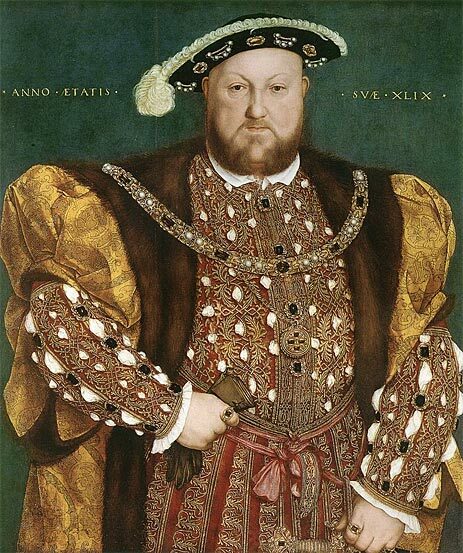 King Henry VIII was dead set on repudiating his wife Catherine of Aragon. It was obvious she had reached the age when she could no longer have children and Henry was in desperate need of a male heir. Also, he had fallen in love with Anne Boleyn, the women whom he hoped to make his wife and would give him sons. But Pope Clement VII was hesitating to give Henry an annulment or divorce because Rome had been sacked by the Holy Roman Emperor Charles V, who happened to be Queen Catherine’s nephew. As early as 1527, Henry was threatening to renounce papal authority in England, thoroughly breaking the connection between England and the continent, represented by Rome. The king’s chief minister Cardinal Thomas Wolsey knew very well that Henry was deadly serious and wrote to Pope Clement, warning him of the dire consequences if he didn’t appease the king and give him what he wanted. Clement agreed to convene a tribunal in England overseen by Wolsey and Cardinal Compeggio. The tribunal was opened at Blackfriars in the summer of 1529. Catherine appeared in person and gave an impassioned speech to little effect. She knew she would not get a fair hearing in this court. Proceedings dragged on. In October 1529, Henry had Wolsey charged with praemunire, a vague offence dating from the reign of King Richard II that involved violating the laws dealing with interference by foreign courts, which in this case meant papal interference. Henry was not only attacking Wolsey for not producing his desired outcome in his marriage, he was attacking the papacy itself. Wolsey would die of illness a little over a year later, before suffering any fatal punishment from the king. The way was open for Thomas Cromwell to rise to prominence as the king’s prime secretary. By the time of Wolsey’s death, Henry had made the decision to not only grant himself an annulment from his marriage to Catherine but to make himself the supreme spiritual authority over England and its people. Cromwell began church “reform” in England. In 1531, the Canterbury convocation was called to order at Westminster. Henry threatened to charge the entire English clergy with praemunire, frightening them into confusion and anger. He also demanded they reimburse him for all his expenses related to his annulment. After days of debate, the clergy offered Henry £100,000 for his expenses. Another £18,000 was extracted from a similar convocation in York later. In return Henry was to issue a general pardon to the clergy so they would not be under suspicion forever. The churchmen also requested a written definition of praemunire from the king so they could avoid committing it again. Their terms included a request that Henry reaffirm the church’s right to manage their courts under their own system of laws and to provide sanctuary to fugitives, and other traditional liberties. In presenting their terms, they addressed the king as the “protector and highest head” of the church in England. This was not enough to satisfy King Henry. He aspired to be called “sole protector and supreme head of the English church and clergy”. In addition, Henry wanted acknowledgement that the responsibility for delivering the souls of the English people to God lay with him, not with the bishops or the pope. This was completely revolutionary. Four days later the convocation accepted the king’s terms and described him as supreme head “as far as the law of Christ allows”, a term that was ambiguous, vague and highly open to debate. However, they equivocated in the “cure of the soul” clause, returning this responsibility to the clergy and the king didn’t object. Things moved swiftly from this point forward. Thomas Cranmer, Archbishop of Canterbury declared Henry’s marriage to Catherine of Aragon null and void. At this point, Anne was pregnant and had been secretly married to King Henry since January of 1533. In the meantime, the pope had declared Henry’s marriage to Catherine legitimate. When he learned of his marriage to Anne, Henry was excommunicated albeit a little late in the game. Next, the Act of Succession was passed in Parliament declaring Henry and Catherine’s daughter Mary illegitimate and Anne Boleyn’s daughter Princess Elizabeth Henry’s heir. The act contained a provision requiring all subjects, if commanded, to swear to Henry’s supremacy as head of the church. The Dissolution of the Monasteries began in 1536. Administrative and legal processes were put in place, dissolving monasteries, priories, convents and friaries in England, Wales and Ireland. Their incomes were appropriated, their assets were disposed and the former personnel and functionaries were provided for. In November of 1534, the first Act of Supremacy was passed by Parliament. The Act gave King Henry and all subsequent monarchs Royal Supremacy and declared him supreme head of the Church of England. Royal Supremacy meant the king had legal sovereignty of the civil laws over and above the laws of the church. The law further declared the king was “the only supreme head on Earth of the Church of England” and stated the crown shall enjoy “all honours, dignities, pre-eminences, jurisdictions, privileges, authorities, immunities, profits and commodities to the said dignity”. This wording made clear Parliament was not granting the king the title (leaving open the possibility they could withdraw it later) but was acknowledging an already established fact. Shortly after this, the Treasons Act was passed by Parliament which stipulated that to disown the Act of Supremacy and to deprive the King of his “dignity, title, or name” was considered to be treason. The most famous person to resist the Treason Act was Sir Thomas More, and he lost his head as a consequence. In 1537, the Irish Supremacy Act was passed by the Parliament of Ireland. This Act established Henry VIII as the supreme head of the Church of Ireland. Henry had fully abandoned Rome. However, when his daughter by Catherine of Aragon became Queen Mary I in 1553, she attempted to reestablish the English church’s allegiance to the Pope and had the Act of Supremacy repealed by Parliament in 1555. Mary died in 1558 and her sister Elizabeth ascended the throne. One of the first acts of Parliament under Elizabeth was the passage the Act of Supremacy of 1558, restoring her father’s original act. It clarified and narrowed the definition of what constituted heresy. A new Oath of Supremacy was required to be sworn by the nobles. This oath gave the Queen’s title as Supreme Governor of the church rather than Supreme Head. Supreme Governor was deemed to be more acceptable to the nobility. It was an equivocal term, making Elizabeth head of the church without actually saying she actually was because it was believed at the time that a woman could not be head of the church. The term would also avoid the charge that the monarchy claimed divinity or usurped Christ, whom the Bible plainly describes as Head of the Church. The Act of Uniformity was also passed in 1558. This act set the order of prayer to be used in the English Book of Common Prayer. All persons were compelled to attend church once a week or be fined twelve pence which was a considerable sum for the poor. These two Acts constituted what is referred to as the Elizabethan Religious Settlement. The Elizabethan Religious Settlement was meant to unify the Church of England after the divisions and chaos created by the prior three monarchs. The Act of Supremacy of 1558 remained in place until the nineteenth century. From then on some of the sections began to be repealed and by 1969, all but section eight had been repealed by various acts of Parliament. The entire Act was repealed in Northern Ireland in 1950 and 1953. Section eight is still in force in Great Britain. Can anyone explain, in a nutshell, the provisions of Section 8? We still have episcopal churches in America, that are in some way connected to C of E episcopacy. Not sure how. As a Methodist, I know our liturgy contains portions drawn directly from the C of E. John Wesley wanted to reform the C of E, not break away. However, it didn’t happen. I am puzzled by such things as Evensongs, Matins, Confessions, Churchings, & Holy Communions, as practiced by C of E.
Anyone able to fill me in? I know I can look it up online, but would prefer to hear from real practitioners. Lately, Methodists have been encouraged to understand more about the C of E, so we better understand Wesley & the roots of his faith. I have the utmost respect for the C of E, and will not ask for more than clarification of terms. Thank you! I tried to find what exactly this means in modern parlance. Does it refer to Parliament’s title, or authority, in lieu of the Monarch’s, of the C of E? Surely, the Queen today doesn’t have real authority regarding policies, doctrines, actions, etc.? Her title “Defender of the Faith”, is a holdover from the Papal honor bestowed on Henry VIII. Is it now simply a title? Does it refer to who defines worship & heresy? Who DOES determines this? Parliament? The Archbishops of Canterbury and York? A council? The American Episcopal Church draws heavily on C of E doctrine. Curious what they do since we don’t have a monarch or Parliament. Sure know Washington pols have no authority, though they often try to interfere with religion! Such a time of turmoil for all the people. So many political and religious (and personal) axes to grind! With Henry determined to have his way. Elizabeth I such a clever lady too, using her feminine wiles in a clever, independent way. It is incredible to fathom that Eluzabeth I became such a strong ruler when she knew her father had had her mother beheaded. A testament to Elizabeth’s determination.